You wouldn't hire an employee without interviewing them, so why would you trust an auto body repair shop to fix your car without first viewing their work? That's just foolish. If you've been in a crash and need professional collision repair in Olathe or Kansas City, place your trust in the talented specialists at McCarthy Olathe Hyundai. 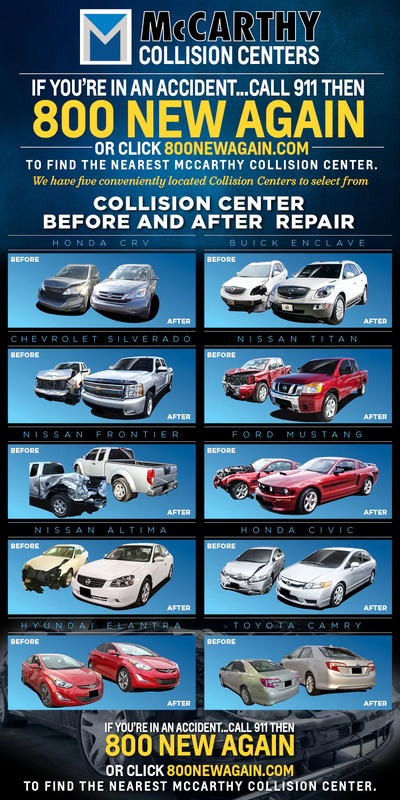 Take a look at our collision repair images to see what our auto body experts are capable of achieving. Schedule an appointment for auto body work by calling us at (913) 827-4139 or dialing 800-NEW-AGAIN to request a tow. The crew at our Olathe collision center is ready to put your vehicle back to work. We'll also help you file and manage your insurance claim, should you need the assistance. Come in for a free estimate today! And if you need to replace your salvaged car after a wreck, we'd be more than willing to offer you a great price on a new Hyundai or an affordable used car. Browse our selection to see what amazing values you can find.